The kingdom of Israel faces a fearsome threat when the Philistine army marches across its borders. At the forefront of the invaders is the giant warrior Goliath. This tall behemoth issues a challenge: he will take on an Israelite champion in single combat and the tribe of the loser will be enslaved. 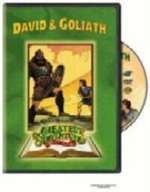 For 40 days Goliath repeats the challenge and there are no comers. Finally one boy does step forth: David, a shepherd boy who is armed with nothing more than his sling...and a faith in God as towering as his mighty foe.